(Newcomb, N.Y.)The Japanese television network NHK is filming beavers at the SUNY College of Environmental Science and Forestry's (ESF) Huntington Wildlife Forest in Newcomb, N.Y. in the Adirondack Mountains. 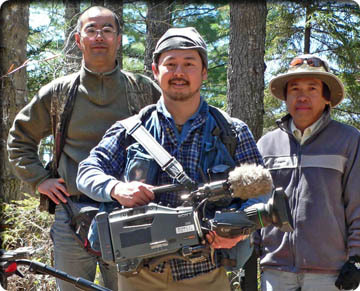 A three-member video crew from NHK (the Japan broadcasting corporation) arrived in Newcomb on May 7 and will be there until June 12. They are producing an hour-long program for the series, "The World," which will be broadcast in July. Team members are Masa Funaki, Ken Tsukakoshi and Hiroshi Egawa. The star of the show is Castor canadensis, the North American beaver. 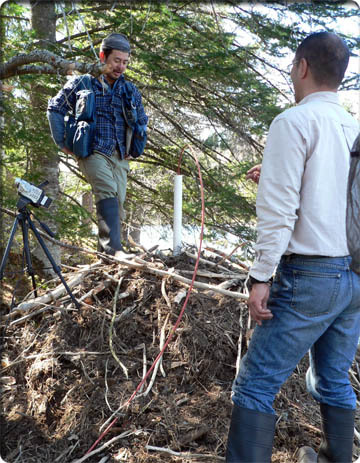 Professor Dietland Muller-Schwarze of the ESF Faculty of Environmental and Forestry Biology is serving as scientific advisor for the program interpreting beaver ecology and behavior. Raymond Masters, instructional support technician at the Adirondack Ecological Center in Newcomb, is providing on-site logistical support. NHK currently serves Japanese audiences via five television and three radio services offering news, education and family entertainment programming. NHK is financed by the receiving fee paid by each household that owns a television set. The Adirondack Ecological Center (AEC) is the leader in ecological sciences in the Adirondack Mountains of northern New York and a major contributor to environmental science internationally. Established in 1971 by the State University of New York College of Environmental Science and Forestry in Syracuse, the AEC provides the science that underpins the management of Adirondack Park as one of the world's foremost experiments in conservation and sustainability. The center attracts scientists from throughout the world, providing a base of operation for research that seeks to understand the natural ecosystems of the northern forest. Together with top educators, the center helps the people of New York preserve and enhance the quality of a wilderness environment while at the same time fostering a vibrant economy. The AEC is located at ESF's Huntington Wildlife Forest, a 6,000-hectare field station in the central Adirondack Mountains of upstate New York. This is not the first time the SUNY College of Environmental Science and Forestry has been featured on international television. Just this past April, a German television crew videotaped the maple syrup operation at ESF's Heiberg Memorial Forest. A ten-minute feature that will show the process from tapping the trees, collecting the sap, boiling it into syrup and packaging it will air on "Galileo" a science show watched by some three-million German viewers. The segment will air May 30, 2005.